The Small Capital Project Grants Programme provides awards of between £5,000 and £20,000 to small projects which aim to help improve existing amenities or to build new facilities that will enable organisations to encourage and support more people to become involved in physical activity, sport and/or play, particularly those who are currently physically inactive. We have a simple Expression of Interest form which you must submit to us so that we can confirm that your organisation and project are eligible for funding. The Major Capital Projects Grants Programme provides funds of between £20,001 and £150,000 for the renovation, modernisation or creation of significant facilities for organisations that can demonstrate a clear commitment to encouraging and supporting people who are not physically active to participate in physical activity, sport and/or play. We expect successful applicants to have a robust business plan in place for the facilities in question as well as effective strategies for increasing participation in physical activity, sport and/or play, especially amongst individuals and groups who are currently physically inactive. 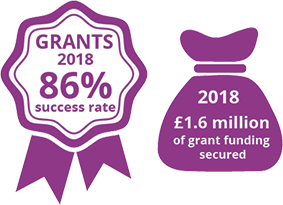 In order to understand the impact of our grants, we also expect successful applicants to have clear plans in place for monitoring and evaluating the impact of the projects that we fund. We have a two-stage online application process for our Major Capital Grants Programme. Stage 1: Applicants must complete an online application form to demonstrate the eligibility of their organisation to receive funding and provide key details on the proposed capital project, why it is needed, what impact it will have and how it will be sustainable in the long term. Stage 1 applications are considered at our quarterly Trustees’ meetings. Stage 2: Those applicants invited to progress to Stage 2 have 12 months from the date of their Stage 1 approval letter in which to submit more detailed information for consideration at one of the quarterly Trustees’ meetings. The Trustees have the discretion to award grants of more than £150,000 towards Major Capital Projects where a particularly strong case is made to demonstrate the impact on The Trust’s priority outcomes. These grants do not usually exceed £500,000 and are selected on an invitation-only basis.